It's time to start taking eye pokes seriously in MMA. On nearly every single card, there's at least one really bad eye poke that leaves a fighter squinting and unable to see. Usually they regain their vision within a few minutes, but it can be worse at times, and sometimes it can be career-threatening. 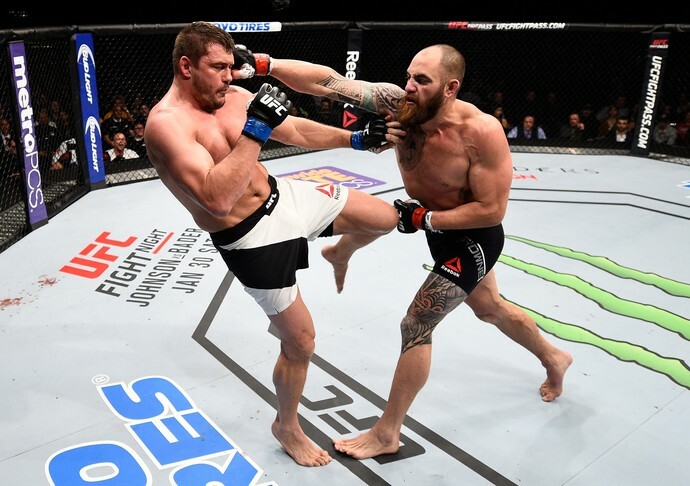 This past week's heavyweight bout at UFC Fight Night 81 between Matt Mitrione and Travis Browne showed how bad an eye poke can be. In the first round of the fight, Browne pawed Mitrione in the eye. 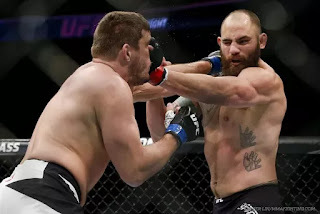 It was bad enough that Mitrione had to take a few moments to compose himself, and fortunately for Mitrione the referee saw the eye poke and allowed a brief break in the action. Prior to the first eye poke, it appeared as though Mitrione was in control of the fight, as he had knocked Browne down earlier in the round. Eye pokes are against the rules in MMA, but after the doctor cleared Mitrione to continue fighting, the ref deemed the eye poke accidental and allowed the fight to continue with no penalty to Browne. And in the second round of what was a very close fight, Mitrione was poked yet again, only this time with a thumb, and this time it was bad. Mitrione stumbled backwards with one eye shut trying to get the referee's attention, but for some reason the referee let the action continue for a little bit until he finally decided to call a stop to the action. Browne, though, knowing his opponent had an eye injury, continued to attack Mitrione, and he could have very well knocked him out had the ref not finally jumped in to pause the bout. After that, the doctor took another look at the eye and let Mitrione continue. The ref let Browne off with another warning, but no point deduction, and Mitrione was now at an unfair disadvantage heading into the last round of the fight. And in the final round, Browne was able to connect with a big punch on Mitrione's already-injured eye, breaking his orbital bone and causing Mitrione's eye to blow up. Unable to see, Mitrione was taken to the ground and finished. 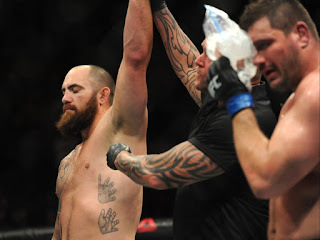 Browne, who had committed two fouls in the bout with no repercussions, was awarded a TKO win and got his win bonus. Mitrione, on the other hand, lost the fight, didn't get his win bonus, and is now a free agent coming off of two stoppage losses. Browne was the favorite heading into the contest and he very well may have won fairly anyway, but we don't know because the eye pokes clearly changed the momentum of the fight. Either way, Browne made a lot of money and has a job today, while Mitrione doesn't have a job and has a shattered eye socket to show for his near 15 minutes in the cage. Mitrione is not the only fighter to have suffered a bad eye poke in the recent past. Late last year at the TUF 20 Finale, Daron Cruickshank was poked in the eye by KJ Noons and had to have surgery on his eye. Since returning to action, Cruickshank has lost three straight fights. It's fair to say that eye injury has changed his entire career. 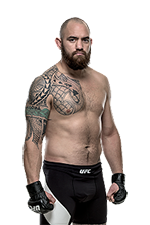 Noons, on the other hand, got away with a No Contest, and he is fighting Josh Burkman on the next pay-per-view card. Unlike Mitrione, who told the doctor he could see, Cruickshank told the doctor he couldn't see, so he was lucky enough not to get a loss from the Noons fight. When asked why he didn't say he couldn't see, Mitrione explained that he wanted a win bonus badly, and considering this was his first fight in six months, it's understandable. It's just very sad that a fighter has to choose to continue fighting with an obvious injury rather than admit he can't see and hope the UFC takes mercy and gives him another fight. Because with no contract past the Browne fight, it's possible the UFC would have just let Mitrione go anyway. In most fights where eye pokes occur, the offending fighter is given a warning, and often two or three warnings. My question is why aren't more points taken? The Unified Rules make it very clear that eye pokes are outlawed, and the rules let the referee make the decision to take a point away for a foul, with the ref usually saying the eye poke was accidental. For whatever reason, MMA referees very rarely take points away for eye pokes (and for groin shots too, but that's another story). I just find it very hard to believe that every single eye poke is accidental. If fighters know they can get away with it -- and they know because refs rarely take points -- then they are going to do it and say it was an accident. After all, if you aren't cheating, you aren't trying, right? As we saw with the Mitrione fight, individual fights are changed by eye pokes, and that's awful. But what's even worse is that careers are changed. Now 37 years old, without a contract, and with a broken orbital bone, it's not unfair to ask if Mitrione's career could be over. And it isn't right, because he didn't do anything wrong, whereas Browne used an illegal tactic to help him win the fight. Life goes on for Browne, but for Mitrione things are very different. Referees need to start being more aggressive in taking away points for eye pokes. No more warnings: These are pro fighters who know the rules very well and they shouldn't be allowed to get away with them anymore. Obviously there are going to be accidental eye pokes, but in a fight like Browne vs. Mitrione, where the fighter who committed the foul sees his opponent injured and yet continues to attack, it's dangerous and it shouldn't be allowed to happen. If more refs started to take points away for these illegal actions, and in some cases even disqualify fighters, I guarantee we wouldn't see as many eye pokes. Fighters wouldn't "paw" with their fingers extended as much as they do now. 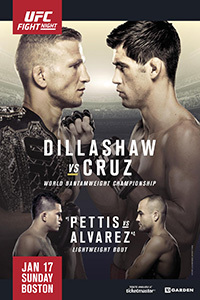 But until the attitude of the referees change, the fighters are just going to have to watch out, and hope that they don't get career-altering injuries because of their opponents disregarding the rules and the referees refusing to do anything about it.